EJOLT partner Environmental Rights Action is at the heart of this campaign, but the letter send to the Pension Fund is signed by a great many scientists and activist, including several who won the Right Livelihood Award (alternative Nobel Prize). The letter was posted on 30 January (see below), but the Fund has not replied yet. We’ll keep you informed when we have news on this crucial battle for environmental justice. We, the undersigned conservation scientists and professionals from around the world, write to you today asking you to take action on a matter of significant importance regarding corporate social responsibility and ethical investment. We are aware of the laudable ethical standards your Council on Ethics has established with which to screen all investments made by the Norway Pension Fund, in particular its environmental standards. We commend you for the previous divestments the Fund has made in mining and forestry companies known to cause severe environmental and human rights related harm in their operations. c) severe environmental damage; d) gross corruption; e) other particularly serious violations of fundamental ethical norms. (4) In assessing whether a company shall be excluded in accordance with paragraph 3, the Ministry may among other things consider the probability of future norm violations; the severity and extent of the violations; the connection between the norm violations and the company in which the Fund is invested; whether the company is doing what can reasonably be expected to reduce the risk of future norm violations within a reasonable time frame; the company’s guidelines for, and work on, safeguarding good corporate governance, the environment and social conditions; and whether the company is making a positive contribution for those affected, presently or in the past, by the company’s behaviour. In this regard, some members of our group and associates have worked for years on the impacts of oil production in the Niger Delta, and we conclude that Shell has for decades caused severe environmental and social harm in the region. Evidence of this includes, but is not limited to, a history of repeated oil spills at Bomu Manifold, Korokoro flow station and Ejama-Ebubu in the minority Ogoni region of the Niger Delta (See Ogoniland Environmental Assessment, UNEP 2011). Further, Shell is well aware of the damage it continues to cause, and has not taken necessary action to remedy the continuing problems. We feel Shell’s long-term negligent behavior in the Niger Delta satisfies the Fund’s standards for exclusion as set forth in Paragraphs 3 and 4 of your Ethical Guidelines referenced above. Although Shell is clearly required by Nigerian law (as well as its own corporate policies) to conduct its oil and gas production, transportation, refining, and export operations with best available international standards, it has knowingly and consistently violated this requirement in Nigeria for decades. Shell is required to meet these high standards in oil infrastructure integrity, spill prevention, prevention of third party damage, monitoring and maintenance of facilities, spill response, spill restoration, and financial compensation. 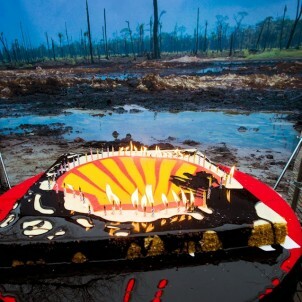 However, Shell repeatedly ignores such requirements for regular inspection and maintenance of oil facilities, upgrading pipelines and production facilities to best available standards, and prompt and effective response to oil spills (See Double Standards: International Standards to Prevent and Control Pipeline Oil Spills, Compared with Shell Practices in Nigeria, Steiner, 2008/2010). To begin to address these issues, some of the signatories to this letter organized and conducted the first preliminary environmental damage assessment of oil impacts across the Niger Delta in 2006, in collaboration with many Nigeria scientists and communities, and found the Delta to be one of the most severely oil-impacted ecosystems in the world (Niger Delta Natural Resource Damage Assessment and Restoration Project – Phase I Scoping Report, Nigeria Conservation Foundation and IUCN/CEESP, 2006). The 2006 study estimated that the average volume of oil spilled in the Niger Delta each year equaled that spilled by the Exxon Valdez in Alaska in 1989 – officially reported to be about 220,000 barrels. It is our conclusion that most of this environmental injury in the Niger Delta is due to the largest and oldest petroleum producer in the there– Royal Dutch Shell. In 2006 our group recommended to the United Nations Environment Programme (UNEP) that it conduct a comprehensive environmental damage assessment of oil impacts in the Delta. Subsequently, UNEP did conduct an assessment of oil contamination in Ogoniland (part of Shell’s operating area in the Delta), and published its final Ogoniland Environmental Assessment last year (UNEP, 2011). The UNEP report agreed with our 2006 assessment, confirming that the region has been continuously and severely damaged by oil. Again, this is Shell’s operating area. It is evident to our group, and many others working and living in the Niger Delta, that Shell has consistently violated its legal and ethical obligations in Nigeria, it is well aware of this continuing problem, it knows how to correct the problems, and yet continues to operate negligently and with impunity. And it is clear that Shell’s behavior in the Delta does not constitute isolated and infrequent accidents. Rather, the company’s willful negligence has continued over several decades. Mr. Chairman, we feel it is time the international community takes a strong stand against such ongoing corporate malfeasance. The Council is also going to investigate more closely the Fund’s investments in coal mines in light of the many accidents in this industry, and is as well as looking into oil pollution in the Niger Delta in light of the many oil spills in the region over a prolonged period and the impact this may have on the environment and human health (emphasis added). Clearly, it would be unethical for the Norway Fund to continue “profiting” from its investments in Shell, while Shell is “profiting” from its continuing negligence regarding the environment and people of the Niger Delta. We applaud your investigation of environmental and social injury caused by oil operations in the Niger Delta. By way of this letter, we respectfully encourage the Council on Ethics to recommend full divestment and exclusion of all holdings of the Norway Government Pension Fund in Royal Dutch Shell, Plc. and its subsidiaries, due to the consistent and severe environmental and social harm caused by Shell’s negligent oil and gas operations in the Niger Delta, Nigeria. We recognize that this would be the Fund’s first exclusion of holdings in the petroleum sector, and as such, feel this would send a powerful message to the petroleum sector globally. We also feel divestment by the Norway Fund will provide strong motivation for Shell to improve its environmental and social performance in Nigeria and globally. Such action would similarly motivate other companies operating in the Delta in which the Fund is invested. Please do not hesitate to contact any of us if you need other information. We would also invite the Council on Ethics to conduct a fact-finding mission to the Delta if you so desire. We look forward to your decision on this important issue.